Green tea is a natural tea, made from unfermented tea leaves. Because green tea is not as processed as black or oolong tea, it is higher in antioxidants. 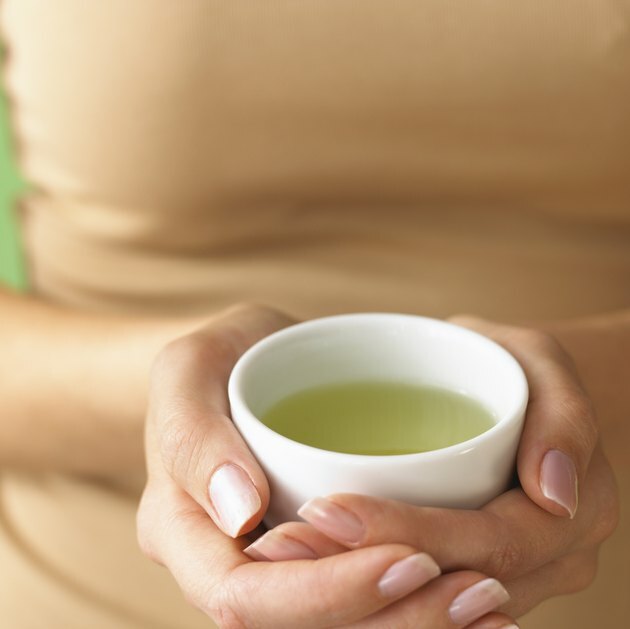 Green tea has a number of potential health benefits and may help protect against certain illnesses. The ingredients in this tea influence hormones in women, affecting estrogen levels and fertility, but it is not clear if green tea has any effect on menstruation. Among teas, green tea contains the highest concentration of polyphenols, an antioxidant, according to University of Maryland Medical Center. Antioxidants help to protect cells from free radical damage, which contributes to the aging process and some diseases. Green tea may be helpful in lowering cholesterol, preventing cardiovascular disease, reducing inflammation in irritable bowel disease and controlling blood sugar. It may also help prevent a number of cancers, including breast and ovarian cancer; but more research on these potential benefits is needed. Many hormones contribute to the menstrual cycle, most notably estrogen. When a girl reaches puberty, the pituitary gland releases hormones, telling the ovaries to produce estrogen and other female reproductive hormones. Hormone levels tell her body when to release an egg, leading to ovulation. The body prepares for a possible pregnancy, and the lining of the uterus thickens. If the egg is not fertilized, the body sheds the lining, causing menstruation. Many factors can influence when a girl starts her period, including nutrition. Green tea may affect hormones levels in women, but no research has linked green tea specifically to menstruation. A 2006 study in "British Journal of Nutrition" found women who consumed high amounts of green tea had lower levels of a specific hormone, 17beta-estradiol, throughout their menstrual cycle. However, whether low levels of this hormone affect the cycle is not known. Another study, published in 2002 in "Food and Chemical Toxicology," showed that green tea extract catechins inhibited aromatase, an enzyme that helps to make estrogen, in rats. This suggests that green tea could hasten the onset of periods by lowering estrogen, but whether it could have the same effect in humans is not clear. Although no research has examined green tea and menstruation, researchers have noted that moderate green tea drinkers are younger at the age of their first period. In a 2010 study published in "Breast Cancer Research," researchers noted some interesting baseline data in Japanese women. Women who drank more than five cups of green tea per day were likely to be younger when they first started menstruating, to have fewer births and a lower use of exogenous female hormones. Women who consumed 10 or more cups of green tea per day had a later age of first menstruation and more births. British Journal of Nutrition; High Tea Consumption Diminishes Salivary 17beta-Estradiol Concentration in Polish Women; M. Kapiszewska et al. Food and Chemical Toxicology; Inhibition of Aromatase Activity by Green Tea Extract Catechins and Their Endocrinological Effects of Oral Administration in Rats; K. Satoh et al. Breast Cancer Research; Green Tea Drinking and Subsequent Risk of Breast Cancer in a Population to Based Cohort of Japanese Women; Motoki Iwasaki et al.